SCR4 N-270 Titan Tankless Water Heater Discounts Apply ! 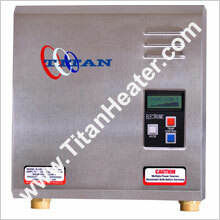 The Titan tankless water heater SCR4 N-270 is the latest addition to our product offering. Boasting 27 kW of heating power, it will meet the needs of most home owners. New for 2017 is the digital LCD screen with real-time readout, as well as the durable stainless steel front cover.